1. Java 8 - download the relevant installation from Oracle site. 2. sbt - download from www.scala-sbt.org version. 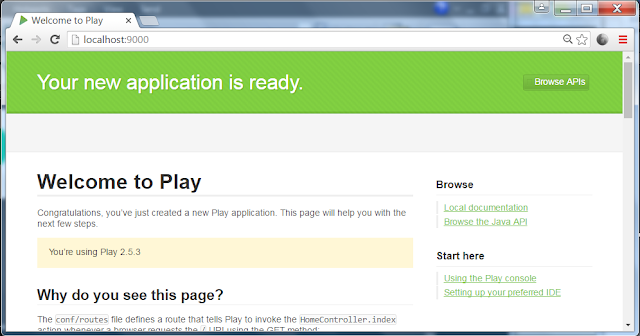 Installation of Play 2.5.3 (the last 2.5 stable release) comes with a minor problem. 2. Create sub-directory conf under the activator root directory activator-dist-1.3.10. 3. Create in the conf directory an empty file named sbtconfig.txt. Start the cmd from the directory, where a new application should be created. In this case you will be prompted to select the desired template and an application name. Be sure to replace 2.4.x here by the exact version you want to use. Play 2.5 generates this line automatically. By default the activator runs an application on port 9000 for http or 443 for https.